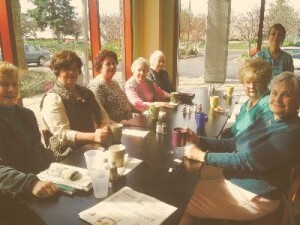 This group usually meets monthly on the first Thursday of the month at 10 AM, just to have coffee and chat, enjoying friendships that have built. New members and visitors are ALWAYS welcome. We meet at Sweet and Savory, 5685 Gibraltar Drive, at the corner of Gibraltar and Stoneridge Drives in Pleasanton’s Hacienda Business Park. Look for the Sweet and Savory van(s) in the parking lot. Our next meeting is on April 4. This entry was posted in Interest Groups and tagged coffee, discussion on September 1, 2012 by slhansen.